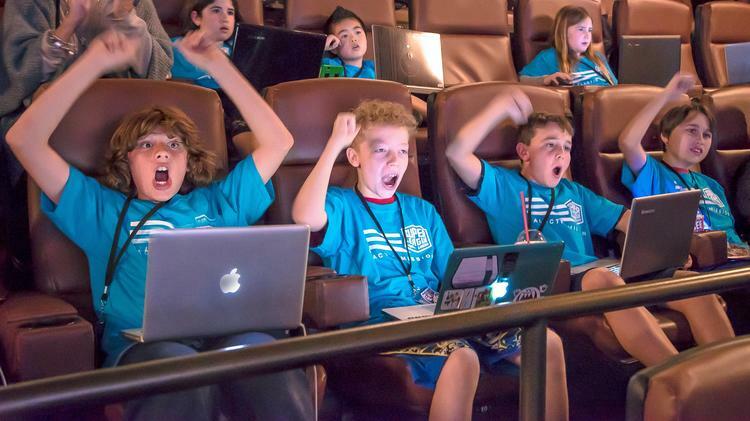 Super League Gaming, a Santa Monica, California-based gaming company, partnered with Harkins Theatres to host tournaments for kids and teens in one of its Gilbert locations. “We’ve looked at Phoenix and long believed it was a great city due to its family-friendly focus — we partnered with Harkins, and they helped us decide that Gilbert’s audience in particular would be a great place for this offering,” said Ann Hand, CEO of Super League Gaming. Kids cheer at the Minecraft City Champs events. Competitors vie for a spot on the city teams, which include the Phoenix Blaze team, to compete nationally. Events kicked off in March and continue to run through May. Hand said the demographics for the tournaments historically has been between the ages of 9 and 13, while the gender skews male. A Harkins representative for Scottsdale-based Harkins Theatres, said the partnership is part of the company's venture into unique viewing experiences. The theater chain also has endeavored into eSports by broadcasting video game League of Legends national and global tournaments at various Valley locations. The Harkins representative said the company is in the process of planning for more eSports broadcasting.